Of course, Cars 2 is still a thoroughly enjoyable family flick that grossed nearly $600 million. That's how good Pixar are. Even their weakest effort is miles better than anything their fellow animators can churn out. So, would Pixar's latest offering, Brave, continue this trend and measure up to the Himalayan-high standards the studio has set itself in the past? In short, yes... And then some. 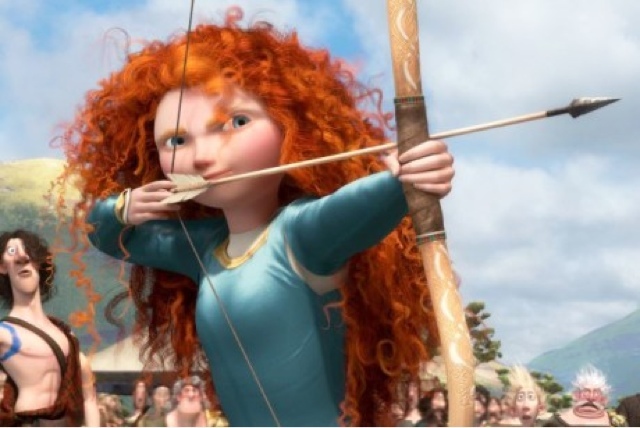 Brave tells the story of Merida, a feisty princess struggling with her royal duties in the Scottish Highlands. There in itself lies Pixar's first triumph. In terms of animation, you couldn't really pick a more challenging backdrop than the lochs and glens of Scotland, but the results are stunning. Even from the opening shots, Pixar's sweeping views of golden forests and rocky mountains towering over Celtic Scotland leave you gobsmacked. Somewhere between life-like realism, and fairytale enchantment; that's Brave down to a tee. Then there's the story. The morals and close-to-home emotions feel like classic Pixar, but lest we forget this is groundbreaking stuff for the studio. This is Pixar's first 'classic' fairytale, and Princess Merida is their first heroine. It's another sign of the Disney seeping into the Pixar. In a lot of ways Pixar IS Disney: ageless audience, timeless stories and bright images. However, what Pixar has brilliantly done over the years (other than revolutionise animation techniques) is bring Disney's ideals into the modern day. Daring story arcs, darker moments and tongue-in-cheek humour adds a new dimension to classic family cinema. Brave, though, is a clear example of what Disney has added to Pixar. Merida's 'feisty princess' follows the likes of Tiana & Rapunzel, and the whole family-oriented storyline screams of classic Walt. Perhaps this is a new form of hybrid then, a glorious middle ground between Disney and Pixar, two studios that started as friends, fell out, buried the hatchet, and are now utilising each others strengths in prolific fashion. Throw in stellar performances from Billy Connolly, Emma Thompson, Robbie Coltrane and Julie Walters, and it's a triumphant return to form the two greatest animation studios of all time. Fun and laughs for all ages, and an emotional punch that will knock you sideways.